With Passover quickly approaching, we thought it might be a good time to remind you of some of the dishes that will grace our Seder table as we munch on matzoh while telling the story of the Exodus from Egypt. Granted, we are cutting it a bit close, but all of these recipes are doable in time for the “first night” to help make your Seder spectacular. While we get a bit iconoclastic with the above recipe, we are truly traditionalists at heart. Especially when it comes to the rest of what graces our Seder dinner plates. And, nothing is more traditional than Haroses (aka Apple-Walnut Relish)! 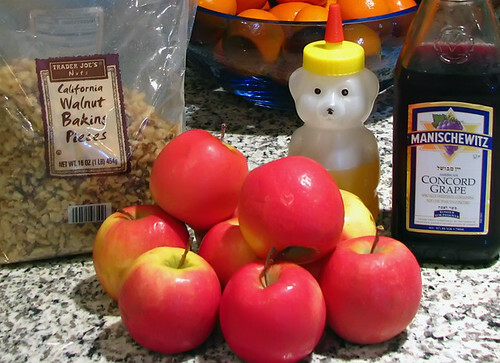 Whether you call/spell it haroses, charoset, charoses, haroset, charoseth or haroseth, it is all the same basic dish – an apple and walnut relish that is a staple of the Passover Sedar. It is meant to symbolize the mortar ancient Jews used to build the pyramids while enslaved in Egypt. But, Haroses isn’t just for Passover, anymore! At least in the Cavehold. We will also use it as a side-relish or topping for fish, chicken, and even pork chops (I can just hear the cries of “Sacrilege!” from the Kosher crowd as I type this 😉 ). This one is easy, too (what else would you expect from this site). All you need are some apples, walnuts, Concord Grape wine, honey, cinnamon, and a food processor, and you are good to go! Really good!! What Passover repast would be complete without some succulent sweets to top off the meal? Of course, anything with flour and/or yeast is verboten. But, that doesn’t mean you can’t have some delicious desserts waiting for you after the last prayer is offered and the last song is sung. One of our all-time favorites is a slew of Mouthwatering Macaroons! These, too, are simple to make and always a crowd favorite. What’s not to love, coconut, vanilla and sweet condensed milk (aka “nectar of the Gods”)? Plus, if you want to take them to the next level, as we tend to do around here, dip them in some dipping chocolate (as seen here). We serve them both, dipped and undipped. Though, I have to say, the dipped ones always seem to disappear first! These are just a few of the dishes we will be enjoying while regaling the Passover tale. I must say, though, that Passover reminds me of the old joke: What is the definition of every Jewish Holiday? They tried to kill us, we won, let’s eat! We hope that you and yours enjoy the upcoming Holiday weekend, whether you celebrate at the Seder or Easter table. 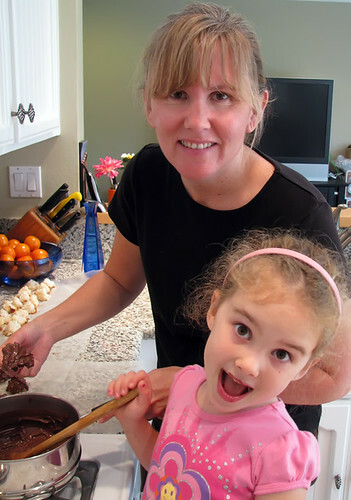 With Passover here, we are sharing a few recipes that we contributed to Cavemom’s Sedar. This is another one courtesy of the Cavewoman! 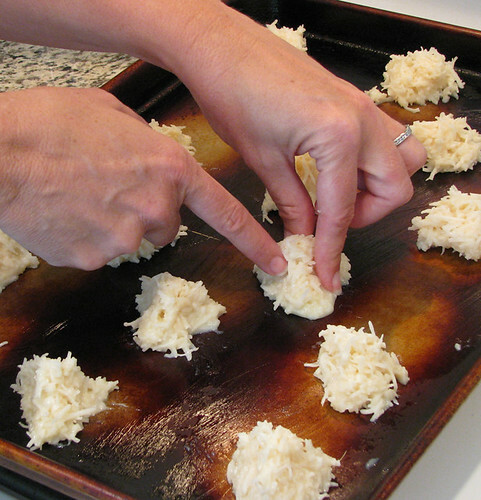 These are simple to make and always a crowd favorite. What’s not to love, coconut, vanilla and sweet condensed milk (aka “nectar of the Gods”)? 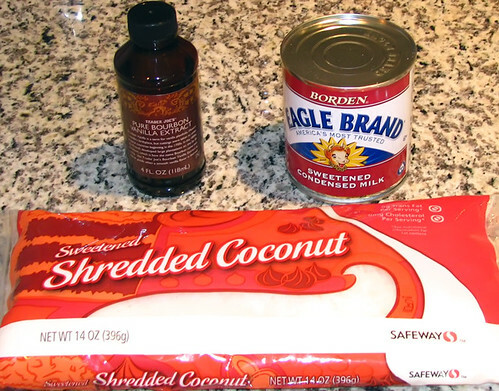 To make, in a large bowl, you simply place together the shredded coconut, sweetened condensed milk and vanilla. Mix well with a rubber spatula. Generously coat two cookie trays with cooking spray. I tried it with buttered pans and it didn’t work as well as using Pam. This picture was with the butter and they were harder to remove, the next batch was with Pam and it was MUCH easier. 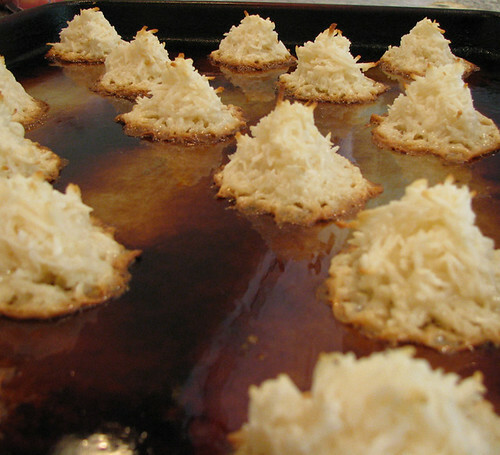 Before you bake, form them into little pyramids. Bake at 350° for 9 to 11 minutes depending on how brown you like them. I actually prefer them a little over cooked because the sweetened condensed milk nearly burnt should be a food group all it’s own. I probably broke off a part of each cookie and ate myself before the party. Don’t judge, I’m weak. I found that removing them from the tray after settling for a minute or so is the best. 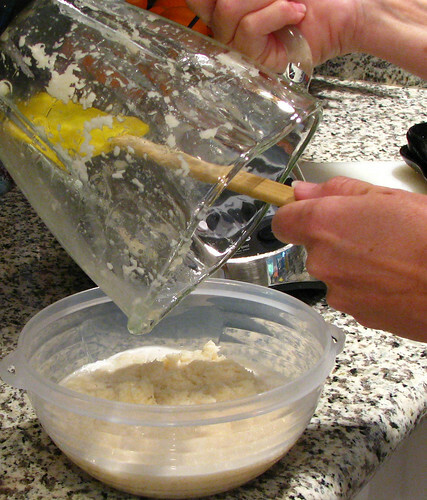 Use two spatulas to remove and place on wax paper. When they cool just a bit more, reform them back into little pyramids. If you are lazy, or don’t like chocolate, you can just call it a day and be done. These are excellent plain. But, if you want to take them to the next level, read on! 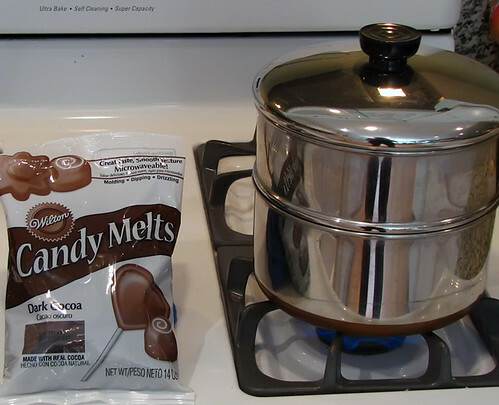 Now for the fun part…….melted chocolate!! We got this from the party store and it was okay, but not as good as the melting chocolate you get from the cake decorating stores. We just moved so we had to settle for what we could find. 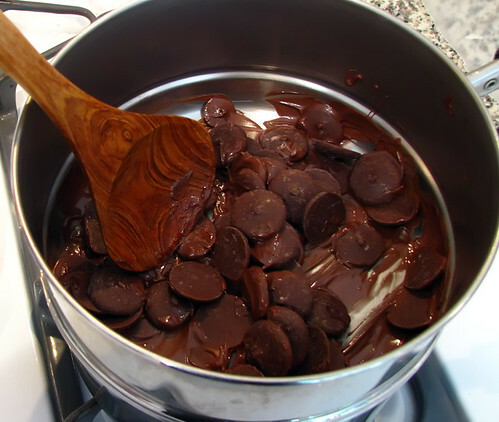 After the cookies have cooled sufficiently, place the chocolate pieces into the double boiler on low. Be careful to not overheat and remove from heat once melted. I made the mistake of overdoing it with the second batch and had to form the chocolate like Playdoh onto each cookie. They turned out tasting great but weren’t nearly as pretty. Look how our girl’s face lights up when chocolate is in her future. Actually, from the look of her upper lip, it looks like she was sneaking licks from the spoon when I wasn’t looking! Just dip each cooled cookie into the chocolate … we dipped all sides and left the bottom plain. After dipping place on wax paper again. It worked out great. Our only mistake was not doing more! They were the first to go!! Next time I’ll dip at least 2/3’s of the batch … if not the whole thing. 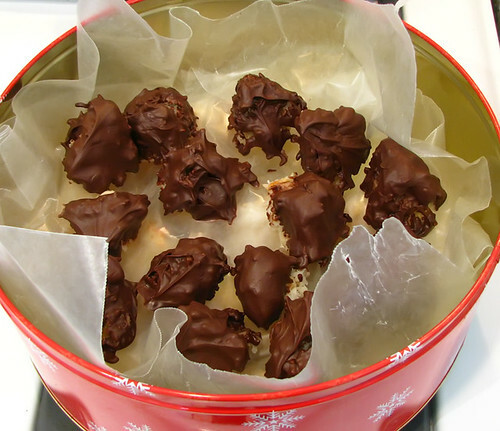 If you have extra dipping chocolate, don’t let it go to waste. 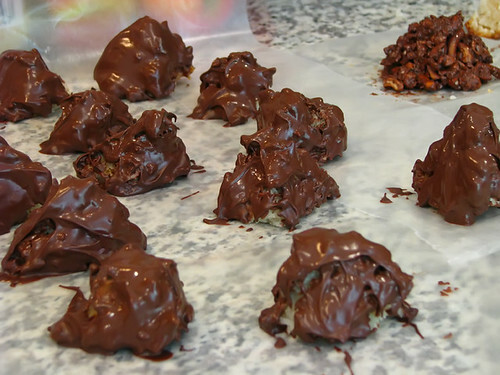 Crumble up pretzels and pour some nuts in to make yummy chocolate pretzel balls. With Passover quickly approaching, we are sharing a few recipes that we will be contributing to Cavemom’s Sedar. NOTE: You may recall the incredible Holiday present I received from the Cave-in-laws back in December: An awesome 11 cup Cuisinart food processor. However, since we were then just beginning the process of packing for our recent move, we decided to put the unopened food tool in storage until we were in the new cave. Well, today was the day we pulled it out and put it into the lineup! Let me just say that as good as it looks, it performs even better. Making this recipe with the Cuisinart was quick and easy. I highly recommend this kitchen aid (no competitor-pun intended), especially if you are going to attempt this dish. 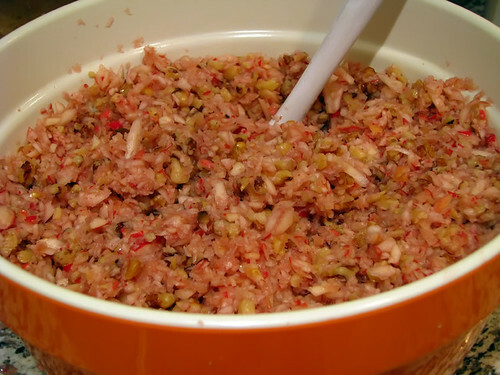 Whether you call/spell it haroses, charoset, charoses, haroset, charoseth or haroseth, it is all the same basic dish – an apple and walnut relish that is a staple of the Passover Sedar. It is meant to symbolize the mortar ancient Jews used to build the pyramids while enslaved in Egypt. But, Haroses isn’t just for Passover, anymore! At least in the Cavehold. We will also use it as a side-relish or topping for fish, chicken, and even pork chops (I can just hear the cries of “Sacrilege!” from the Kosher crowd as I type this 😉 ). Believe it or not, this is all you need to make haroses. Well, you also need some cinnamon … somehow it didn’t make it into the shot. First, core and slice apples. Doing this with an apple slicer/corer is a real time and mind saver. HINT #1: We used the new Pink Lady variety of apples this year … they are perfect for this dish! 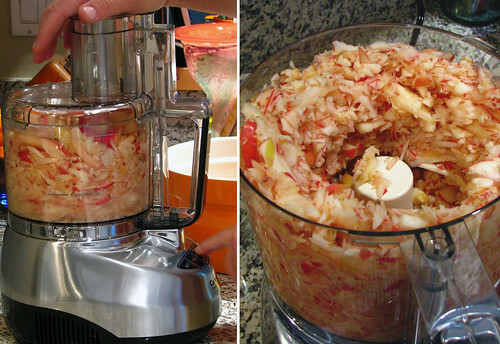 Put appropriate amount of the apples into food processor. Alternate 1 second on, 1 second off with the “Pulse” button until apples are sufficiently chopped fine. Take care not to puree. 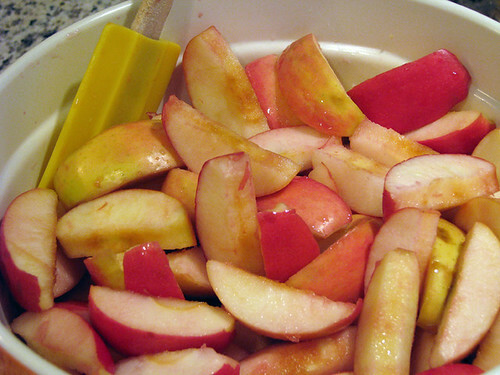 Place chopped apples into large bowl. Add remaining ingredients and fold in well. HINT #2: Before adding the honey to the mixture, place it into a cup with a little bit of the wine and zap it in the microwave for about 10 seconds, then stir well. This will make distributing it evenly throughout the mixture much easier. Cover mixture and refrigerate until ready for use. This will last a week cold-stored in an airtight container. 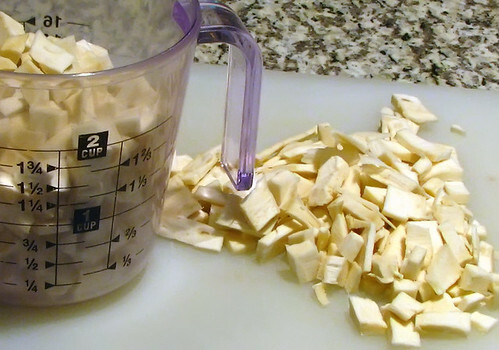 Peel and chop three cups worth of fresh horseradish root. 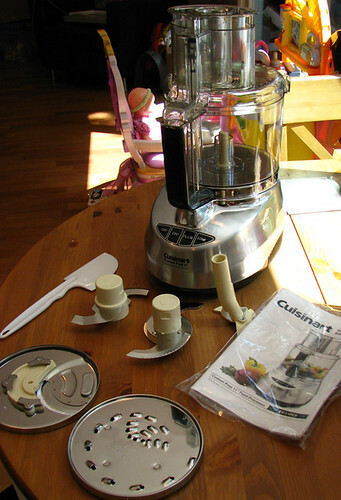 Place into blender or food processor with fine chop attachment. 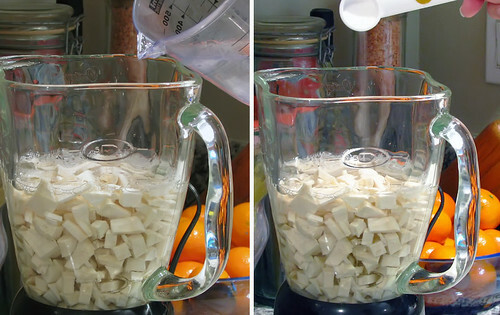 Add vinegar, sugar, and salt to blender. Process ingredients until pureed. With a rubber spatula, spoon mixture into airtight container. 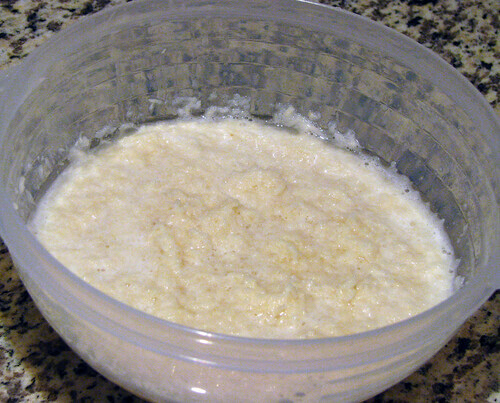 Cover mixture and refrigerate until ready for use. May be refrigerated up to 30 days. NOTE: This stuff is the real deal! It is kind of strong, but goooood!! 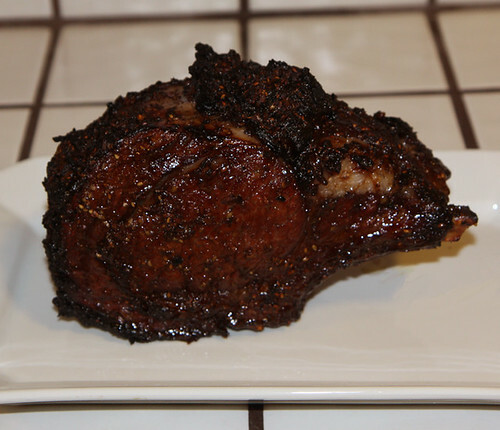 This makes a great base for a creamed horseradish sauce for prime-rib or other roast beef dish … just add sour cream. It’s also good for spicing up a cocktail sauce or added to a soup/broth. NOTE 2: If you prefer the “red horseradish”, just boil 3 medium beets until soft, peel completely, and add them to the pureeing process above.